sisu: "Not to represent patients in a stigmatized way"
"Not to represent patients in a stigmatized way"
"Fans agree Germany's polar-bear cub too cute to kill." It's a start, but common sense and common decency are no guarantee. "With animal-rights activists like this, what animal needs predators?" asks Captain Ed rhetorically re the "save the village by destroying it" animal "rights" protector who demanded zoo-born cutie-pie Knut (above ARCHIV ZOO BERLIN / AP), rejected by its mother, be euthanized, saying "The zoo should kill the baby bear. Otherwise it is condemning the bear to a dysfunctional life, and that too is a breach of the law.” Our own prescription, akin to Laurence Simon's prescription for the makers of that pet food that horrifically killed some of our fellow Americans' best friends: Feed chunks of the dysfunctional animal-rights activists -- in gravy -- to the bears. Instead of flowers, Seipp had requested that people make donations to the Humane Society, http://www.hsus.org. In addition to the Humane Society, I also want to acknowledge the Lung Cancer Alliance . . . I got an email from them explaining that one of their goals is not to represent patients in a stigmatized way. Not all lung cancer patients were smokers. My mother was frustrated on her blog that there is more funding for the more popular diseases of breast cancer, AIDS etc which have more hope than lung cancer which is a harder way to go. Before we continue, let us say one more time that we recognize that orchestrated attempts to silence opposing voices are the essence of human nature. Dr. Sanity drums it into our dear little ear daily. If there's something politically incorrect you can pin on a sufferer, your feeling-good-about-yourself points rise exponentially. Every totalitarian regime throughout history, from antiquity to the present, exhibits the same behavior. It's sandbox dynamics writ large. "Climate Change" proseletyzers who stigmatize skeptical scientists as "deniers" are only the latest totally un-self-aware example of the genre. The witch burners of Salem are always with us. 'Guess we'll head over to the Lung Cancer Alliance -- as opposed the preachy American Lung Cancer Society -- to put our money where our breathing apparatus is. 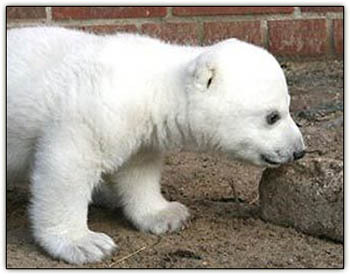 That polar cub is fantastic. What a great pet for a few months until it decides to eat one. What makes Nut Cake humans think they know that animals would not prefer to be housed and fed rather than face the aggressive world of the wild. Would our dogs and cats rather live in the wild subject to predation and sometimes starvation? You got it. Feed em to the carnivores. This really riles me up. My mother died when I was five. Should I have been put down because I was raised without the care of a loving mother. Life has not been all roses, but I am now 87 and don't think I would have been better off dead rather than an exception to the normal childhood. Goomp is the Energizer Bunny. He puts the rest of us to shame. "What makes Nut Cake humans think they know that animals would not prefer to be housed and fed rather than face the aggressive world of the wild." Goomp - these are the same people who want "indigenous peoples" to continue living in grass huts with no electricity and running water or other comforts of modern life... because it would "change their society"... Sheesh! these people are insane. If they want to live that way - then go do it - but don't make other people live like that - or kill innocent polar bear cubs for that matter. As far as lung cancer not getting the support that AIDS and breast cancer get... it's all in the advertising. Of those two diseases, AIDS is the most "politically incorrect" as far as mainstream people are concerned. Yet they've advertised it to the point that people give (even if they'd rather support research for another disease) because they are made to feel wrong for not supporting it. Breast cancer has a huge huge ad budget. They have people who got behind the effort and they've also used political correctness. Basically they advertised for years that breast cancer wasn't getting the money it needed because "men's illnesses were getting all the research money". Now they've got such a momentum going that they easily raise quite huge amounts of money. Yet more women die from heart disease than cancer... ask Dr. Helen about that. If lung cancer is going to get the money - they need people to push it into the limelight. For too long it's been ignored (mainly because people died so quickly once it was diagnosed). That's the way the donation coins bounce. It's all in the packaging. These are the same people that are against the death penalty for murderers.